12 I watched as he opened the sixth seal. There was a great earthquake. The sun turned black like sackcloth made of goat hair, the whole moon turned blood red, 13 and the stars in the sky fell to earth, as late figs drop from a fig-tree when shaken by a strong wind. 14 The sky receded like a scroll, rolling up, and every mountain and island was removed from its place. Not specified in the account. The stars falling from the sky provides the main source of light for this scene. We know from verse 12 that the sun is not shining any more, so obviously it isn’t providing any light for this scene. 01) (This page) Revelation 06 – The Scroll seals – Scene 06 – Sixth seal: Great earthquake (with scroll). 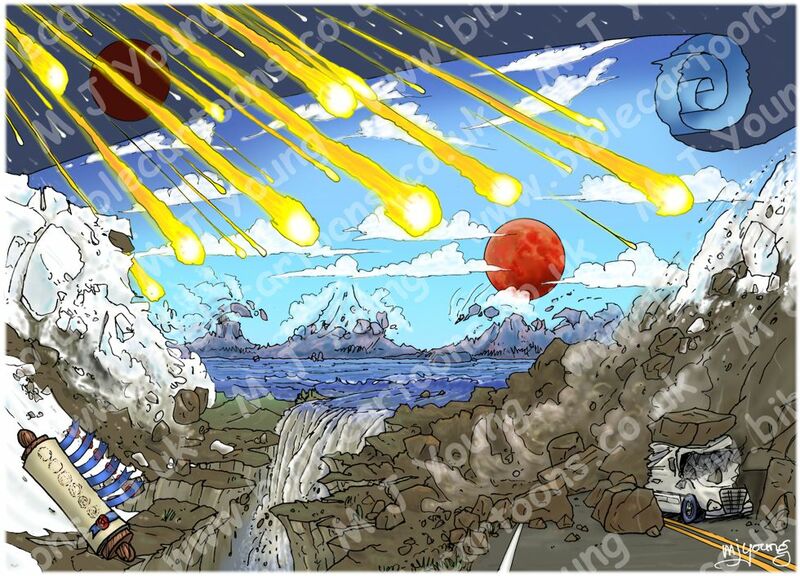 02) (Next page) Revelation 06 – The Scroll seals – Scene 06 – Sixth seal: Great earthquake (without scroll). The only difference between the two versions is the inclusion or absence of the 7 seal scroll in the bottom left corner of the scene. I wondered if it might detract from the overall impact of the scene for some viewers, hence its absence in the 2nd version. I really enjoyed drawing and colouring up this scene, even though the subject is pretty serious. There is lots of drama and action included, which made the scene fun to draw. The great earthquake is represented in the picture by the snow and rock avalanches in the foreground, and by the islands on the horizon, which are slumping and tumbling down; literally “every mountain and island was removed from its place.” (verse 14). Notice the truck in the right foreground, which has been partially crushed under a huge rockslide. I also decided to include a great jagged tear in the ground (in the left foreground) into which the sea is pouring like a great waterfall. The sun is the dark red disc in the top left of the picture, with the blood red moon in the middle/right of the cloudy sky. The stars falling to earth add a dramatic sweep of fiery yellow and orange across the sky, which is “receding like a scroll, rolling up”. 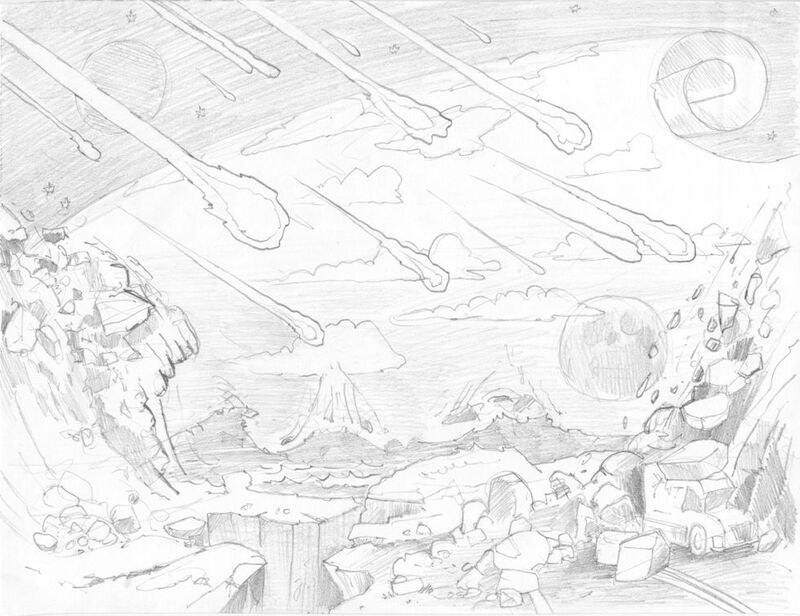 Here’s the initial greyscale pencil sketch I drew of this cartoon.